La tetera “Teatime” busca fusionar un diseño moderno y depurado con la herencia y tradición del acto de tomar el té y todo lo que este ritual representa. Básicamente nos centramos en mejorar la interfase con el usuario en relación al tiempo que deben estar las hebras de té en contacto con el agua caliente antes de tomarlo, para obtener un té con todo el potencial de su aroma y sabor. Para lograrlo generamos un cilindro de vidrio que en su interior contiene un reloj de arena plano. Este cilindro se cierra con dos tapas de fundición de aluminio que se fijan entre si mediante dos varillas roscadas que al enroscarlas sobre la tapa superior, ejercen presión sobre el cilindro, cerrándolo herméticamente mediante unas juntas de goma que contienen las tapas. De esta manera, por la parte superior se colocan las hebras de té y el agua. Se cierra la tapa y se gira la tetera 180°, ubicando la tapa superior como base. Es aquí que el reloj de arena comienza a trabajar, marcándonos el tiempo restante para que el té se encuentre listo para tomar. Luego de que el reloj finalizo el conteo, se abre el pico vertedor de la tapa que se encuentra arriba y se sirve el te, tomando la tetera de dos zonas de silicona que permite que el usuario no se queme. The teapot “Teatime” searches to fuse a modern design and refined with the heritage and tradition about the acting of having tea and all which this ritual represents. Basically we concentrate in improving the interface with the user in relation to the time that herbals must be in the tea, in contact with the hot water, before drinking it; to obtain a tea with all the potential of its aroma and taste. To obtain this we generate a cylinder of glass that in its interior has a flat hourglass. This cylinder is closed with two lids of smelting, made of aluminum, that are fixed between them through two coiled rods, that when they are coiled up over the top lid, they exert pressure over the cylinder, hermetically sealed, through rubber joints that contains lids. In this way, put the tea herbals and the water in the upper part, close the lid and turn the teapot 180º, putting the upper lid as a base. 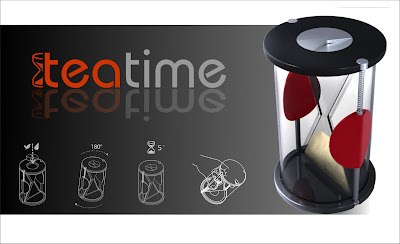 It is here that the hourglass starts working, marking the remaining time so the tea is ready to drink. 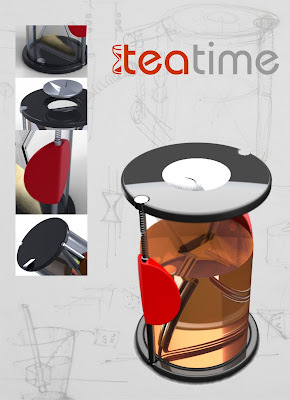 Then when the clock finish the count, open the pouring spout of the lid that is located up and serves the tea, handing the teapot with two zones of silicone that allows that the user does not burn.